With the holidays approaching, I wanted to remind people about my book Beyond Batting Average. I'm pleasantly surprised that the hard copy version of the book continues to sell pretty well without much promotion. I can thank Google, Amazon, Twitter and a number of internet friends for that. Not as many people know about the less expensive e-book that can be purchased on Lulu.com. 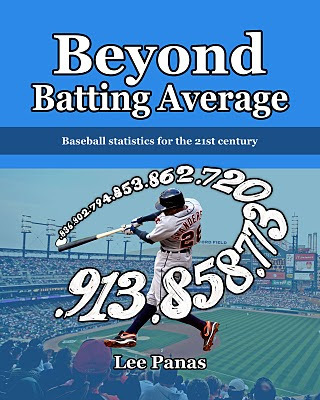 You can purchase the e-book version of Beyond Batting Average for $4.00 on Lulu. The hard copy version costs $14.00 (also available at Amazon). Beyond Batting Average was published in 2010 and I believe it is still the most up-to-date and comprehensive sabermetrics primer available. It is accessible to fans who are trying to learn sabermetrics and would like a more organized and broader presentation of the subject than you'll typically find on the internet. My book serves as a good introduction to more advanced books such as The Book by Tom Tango, Mitchell Lichtman and Andrew Dolphin. What the book does particularly well is explain complicated concepts in simple terms. I have no doubt that you'll find it easy to keep up with the stats that Panas presents. I was also impressed with how comprehensively Panas covered each topic; on several occasions, he delved into metrics that even I would not have thought to include in the discussion. Simply put, after reading this, you will be able to converse about sabermetrics with pretty much anybody and hold your own. I have this book and I love it. If you read this blog, this book will be for you! Indeed, or it is a safe gift idea for the holidays, as long as the person likes baseball you can't go wrong with this!